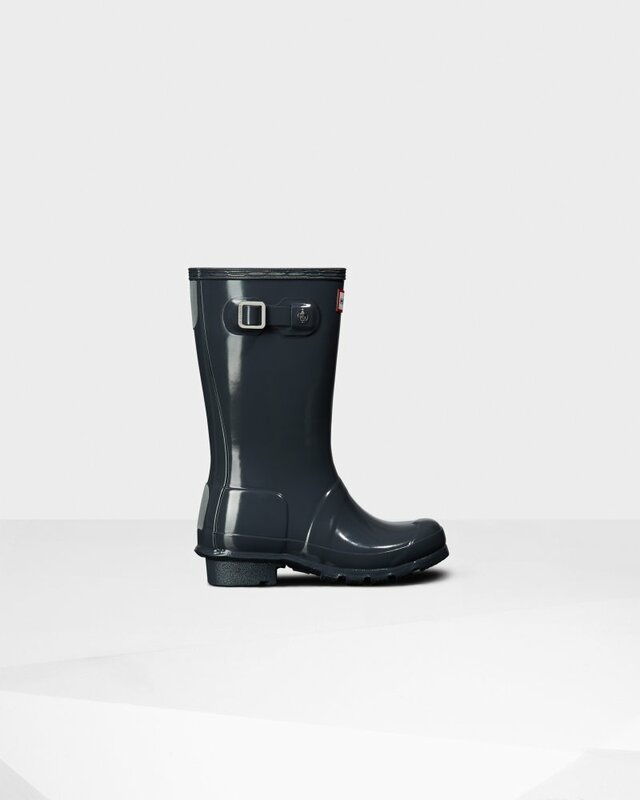 A mini version of the iconic Original Tall Boot, the Original Kids Gloss Wellington is a dream for junior explorers. This slate gray waterproof boot is handcrafted from natural rubber with a gloss finish. Designed for adventures, our specialised kids wellies are highly resistant to wear and abrasion with a polyester lining for comfort. Reflective patches and the Hunter Original tread offer added safety so you can be confident letting them take on the elements whatever the weather. Rated 5 out of 5 by Anonymous from Black gloss Amazing fit and very comfy, the look great and they last forever, I have only just replaced my others which I’ve had about 10 years! Rated 5 out of 5 by Steve from great colour and fit Once again excellent product from Hunter, our Daughter loves her new boots we added the optional fitted socks which is a lovely addition. Chloe had great fun using the colour chart to personally choose her boots and socks to match. Rated 5 out of 5 by Barmstick from Great boots. Recently purchased the yellow boots to match my coat & car. Love them to bits. Comfortable, fantastic colour & definitely a talking point. Rated 5 out of 5 by Englishgaal from Excellent quality Looks just like the picture. A good deal if you are an adult with small feet. Rated 3 out of 5 by HOYS18 from Great wellies tho the “Lilac” shoukd be “ Berry” My daughter and l love our Hunter wellies. We ordered the lilac colour( when there was 20% off) as in the photos it looks like the signature colour for Horse of the Year show. When they arrived they are very different- more a berry colour so they will have to go back !